Crime thriller is a genre which has a spike in demand among readers nowadays. Even authors try to give their best while creating a story out of nothing. 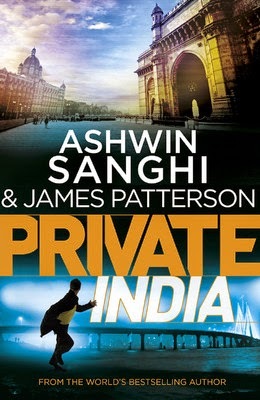 Author Ashwin Sanghi & James Patterson have collaborated to create the collateral effect of a book under Private series called "Private India" So has their collaboration clicked? Let's find out. First look at the title and the cover and one can easily figure out that the book has thriller written all over it. But the catch is change in the setup which brings the Private series to our very own tinsel town Mumbai. The cover image giving the befitting start to the story. The blurb talks about an organization, a series of murders and an ex agent who now is at the helm of cracking one of the most eluding cases of all times. The blurb has been painstakingly kept short for the readers to pick up and go through the entire story. The story has been setup in Mumbai where a series of murders across the city brings together the Police and Private India an organization which specialises in solving the improbable. Santosh Wagh the head of the Indian unit is bit ruffled when the entire drama doesn't stops and gradually gains momentum leaving him and his team clueless. But there are more sinister things happening under his nose and it's upto him and Private India to keep their personal lives aside and step up the gas to catch the mastermind behind these planned murders. So will Santosh Wagh and Private India succeed? Will this be a smooth ride or there are obstacles which will jolt them out of their comfort zone? Or is there a twist in the already gruelling tale? Join hands with Santosh Wagh on a not so private journey of him and his organization Private India termed "the best in the world". The book has it all which one expects to be there at the time of unfolding the plot and the vice like grip in which the readers succumb along with the story. The precious elements of mystery, furious pace, the highs and lows, a strong leading protagonist and an ever alluring antagonist sets the tongues wagging by the end. The book managing to run the entire drama in a the most vivid and gory fashion. The slips ups are none and it sets the heart thumping once the entire sequence of events unfold in front of the eyes. Santosh Wagh and his organization Private India have been given enough leverage and make them toil hard for the entire book. The story has no downside whatsoever. All in all if you want to dance to the tunes of a crime thriller this is the one for you. There's hardly any breathing space as the element of surprise will catch many off guard one after the another. It's like a thunderbolt it hits hard and hard enough and then disappears with the blink of an eye. For all the choicest of locations, the numerous disjointed dots and multiple problems for the people to handle there's fun, excitement and above all there's snappy rhythm to it which will not let you keep down the book. Surrender your soul and you'll find solace once the book gets a befitting end. High octane performer under tough conditions.